For the related function in opera, see Prompter (opera). An 18th-century prompter at work. The prompt book from an 1874 staging of Hamlet by English actor and manager Henry Irving (1838-1905), in which he experimented with using limelight (burning calcium oxide) to represent the ghost of Hamlet’s father. The prompter (sometimes prompt) in a theatre is a person who prompts or cues actors when they forget their lines or neglect to move on the stage to where they are supposed to be situated. Nowadays, many of the earlier duties of the prompter are undertaken by the stage manager, who will have a copy of the script called the prompt book. This is the most definitive version of the script for any one performance, and will contain details of all cues, with their precise timings with respect to the action on stage. This allows the prompt to direct lighting, sound, flying effects and scene changes during a show. The prompt book also often contains blocking notes, so that the prompt is always aware of the intended positions and movements of all the actors on stage at any given time. In some professional and high-quality community theatre productions, the prompt is never used during a performance to instruct actors if they forget a line or movement, only during a rehearsal. If prompting is absolutely necessary, it is done very quietly by another actor on-stage. The prompt is located on the stage, in the prompt corner or "prompt side". In Elizabethan theatre the function of prompting was filled by the Book-Holder, who was also in charge of props and calls. ^ Kennedy (2010), Pavis (1998, 289), and Taylor (1993, 253—254). ^ a b Kennedy (2010). ^ a b Hartnoll and Found (1996). Hartnoll, Phyllis and Peter Found, eds. 1996. The Concise Oxford Companion to the Theatre. Oxford: Oxford University Press. ISBN 0-19-282574-7. Kennedy, Dennis, ed. 2010. The Oxford Companion to Theatre and Performance. Oxford: Oxford University Press. ISBN 978-0-19-957419-3. Pavis, Patrice. 1998. 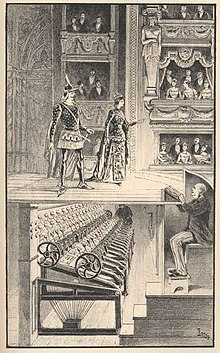 Dictionary of the Theatre: Terms, Concepts, and Analysis. Trans. Christine Shantz. Toronto and Buffalo: University of Toronto Press. ISBN 0-802-08163-0. Taylor, John Russell. 1993. The Penguin Dictionary of the Theatre. 3rd ed. London: Penguin. ISBN 0-140-51287-X. This page was last edited on 25 June 2017, at 23:39 (UTC).